I baked this cake in three 6-inch pans, but the recipe could be made in two standard 8-inch pans. If you're an avid baker and ever get the chance to pick up some 6-inch pans, I highly recommend doing so! Six inch pans make such a beautiful little cake - small but tall, an eye-catching centerpiece. The cake begins with moist and slightly dense coconut cake layers. Cream of coconut (also labeled Creme de Coconut) is the magic ingredient that really makes the cake's texture special. You can usually find it in the cocktail supplies section at the grocery store. It's thick, syrupy and sweet like dessert, so coconut milk is not a suitable substitution. The filling is simple - pineapple chunks that have been crushed and patted dry with paper towels. You can use fresh pineapple or canned, but if you use canned I recommend purchasing unsweet pineapple in pineapple juice (instead of heavy syrup). 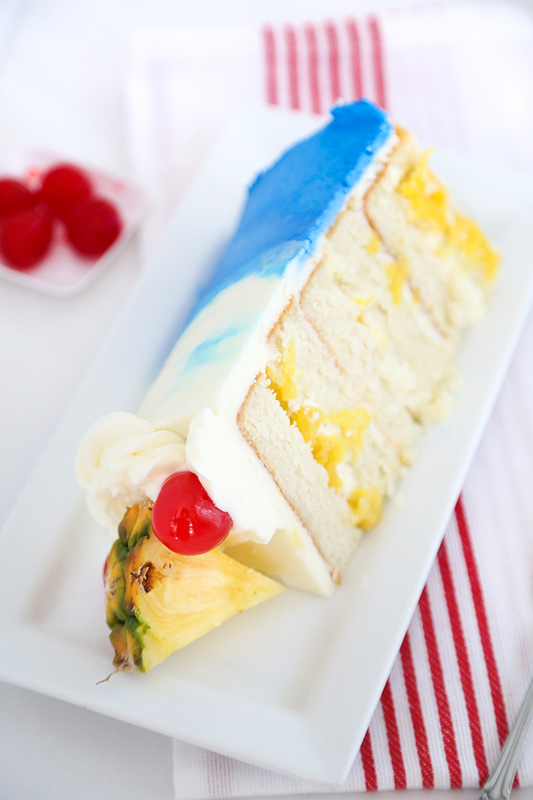 The acidity of naturally sweet pineapple is best in this cake. 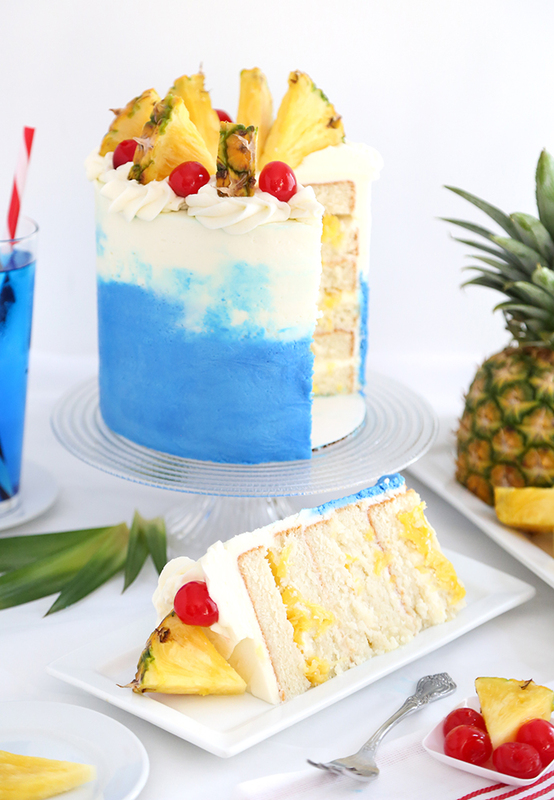 Light rum and blue curacao buttercream frostings round out the tropical flavor of this cocktail cake. 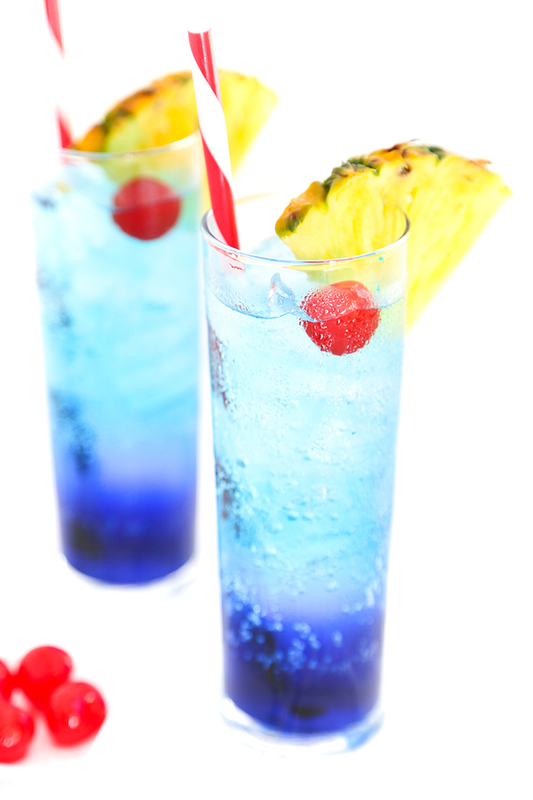 If you're absolutely against using alcohol in the frostings, you can make a non-alcoholic version by using rum extract in place of the light rum, and orange extract in place of the blue curacao. 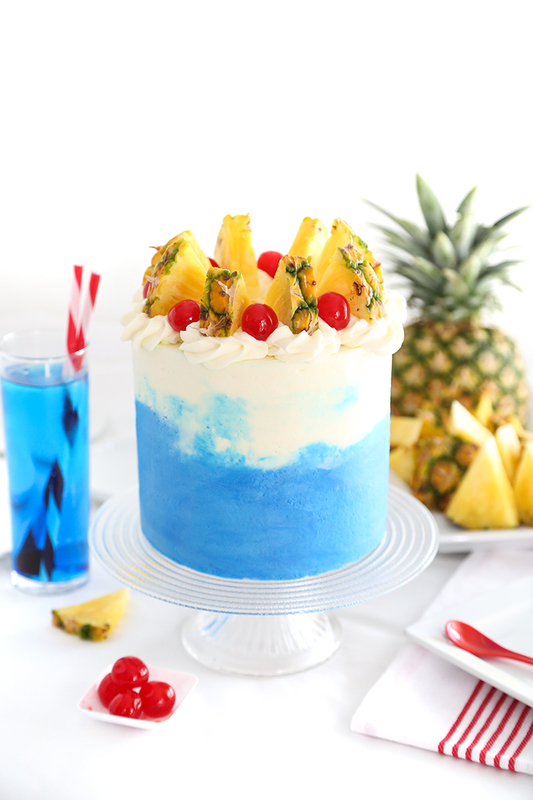 A Blue Hawaiian cocktail is never complete without a fresh pineapple slice and maraschino cherry on the side, so I loaded the top of this cake with both. The only regret I have is the lack of a cute paper umbrella - oh well. Next time for sure! 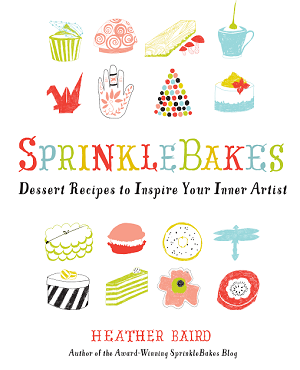 I hope everyone is having a great summer and has the chance to indulge in a little fun - and cake! Make the cake layers: Preheat oven to 350 degrees. Grease pans and line with parchment. Sift together flour, baking powder, and salt. Whisk together egg whites and milk in a separate bowl. Beat butter using the paddle attachment until soft and creamy. Add sugar gradually and beat until light and fluffy. Add the cream of coconut and mix until incorporated. Scrape down the bowl as needed. Beat in coconut extract. Add flour mixture alternately with the egg white/milk mixture. Begin and end with flour mixture and beat until smooth on medium-low speed after each addition. Divide batter between pans. 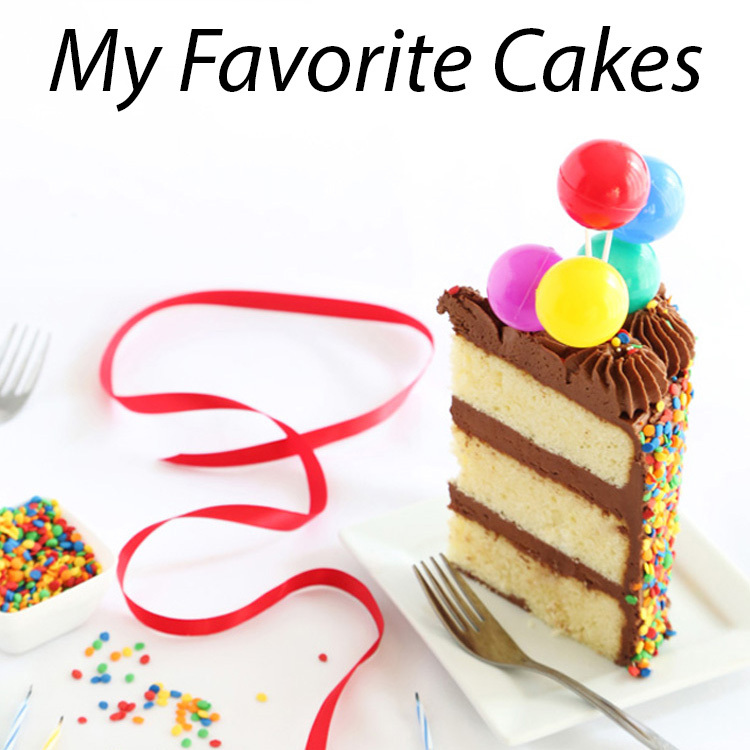 Bake 6-inch cakes for 30 minutes or 8-inch cakes for about 35-40 minutes, or until a toothpick tester comes out clean. While the cakes are still hot in the pans, place a clean lint-free towel on top of the cakes and press gently to level them. Be careful because as you press this can cause steam to release. Fold the towel in half to double thickness; this will prevent burning your hand. Let cool slightly in pan, then turn out and cool completely. Torte each cake (cut in half horizontally) when completely cooled. Make the buttercream: In an electric mixer fitted with the whisk attachment, mix together the butter and confectioners’ sugar on low speed. Gradually add the heavy cream until the mixture comes to spreading consistency. Add the rum extract and whip until light and fluffy. Remove half of the frosting and transfer it to a piping bag with no tip or coupler attached and cover the remaining frosting with a damp towel so it doesn’t dry out. Assemble: Drain the pineapple chunks and pat them dry with a paper towel. Use the bottom of a glass to crush the chunks slightly and then pat dry again. Apply a very thin layer of frosting on the outside of the entire cake (crumb coat) and then chill until firm. You should have leftover rum buttercream in the piping bag. Save this for later use. Meanwhile, make the blue curacao frosting. Add 2 tablespoons blue curacao, the orange extract and the blue food color to the remaining frosting in the mixing bowl. Whip until well incorporated. 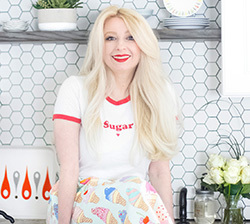 Add additional confectioners’ sugar if the icing becomes too lax with these additions. Transfer the frosting to a piping bag with no coupler or tip attached. When the cake is well-chilled, pipe blue frosting around the outside of the cake, about 2/3 of the way up. Continue the rest of the way up with the white rum frosting. 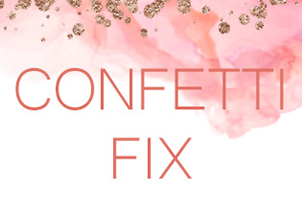 Smooth the frosting with a spatula (don’t worry if the colors mix into each other – we want that to happen!). Use a bench scraper or cake smoother to even the buttercream on the sides of the cake. When you’re satisfied with the appearance, chill the cake until firm, about 30 minutes to 1 hour. To further smooth the frosting after chilling, use a spatula warmed in hot water (wipe dry first) to run over the surface of the frosting. 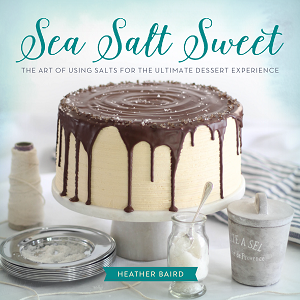 This melts the butter in the buttercream and levels an uneven surface. Drop a large open star decorator tip into a disposable piping bag and squeeze leftover rum buttercream into the bag. Pipe swirls of frosting on the top edge of the cake. Garnish the cake with maraschino cherries and fresh pineapple slices. Store the cake in the refrigerator. Bring to room temperature before serving. This is so beautiful! 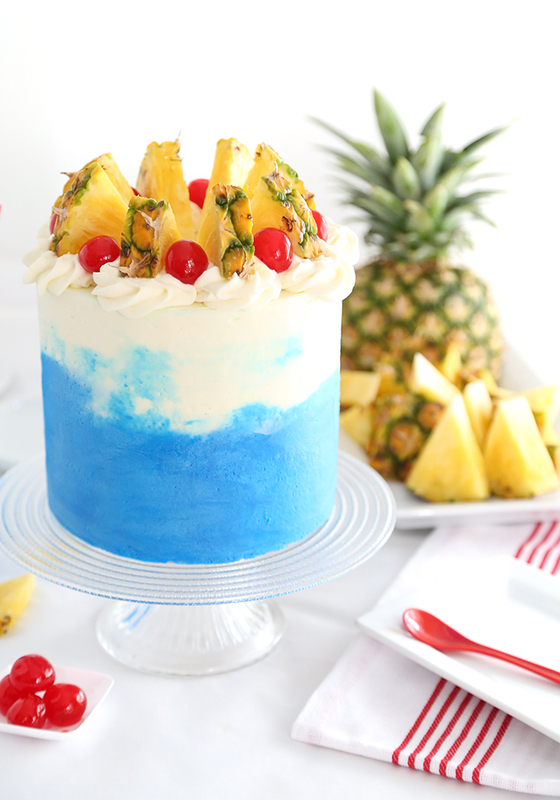 I love this idea of a tropical cake. Ahh this is stunning! So perfect for a summer party!! This cake is gorgeous! 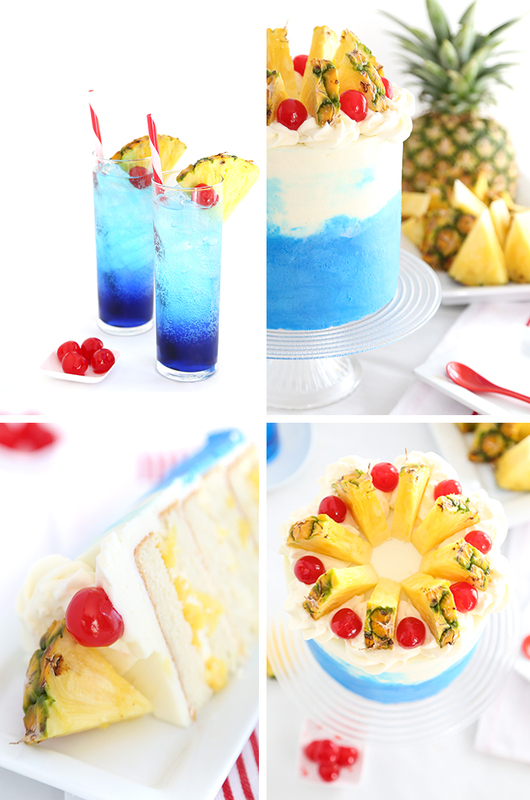 I love blue Hawaiian cocktails, maybe our Halloween theme this year could be Hawaiian so I can make this gorgeous cake! I love the blue in this cake! It's so vibrant and gorgeous! Love it! What a fun summer idea! I love this cake for summertime, mmmmmmm! How much half and half or heavy cream do you use? Add one tablespoon at a time until the mixture comes to spreading consistency.